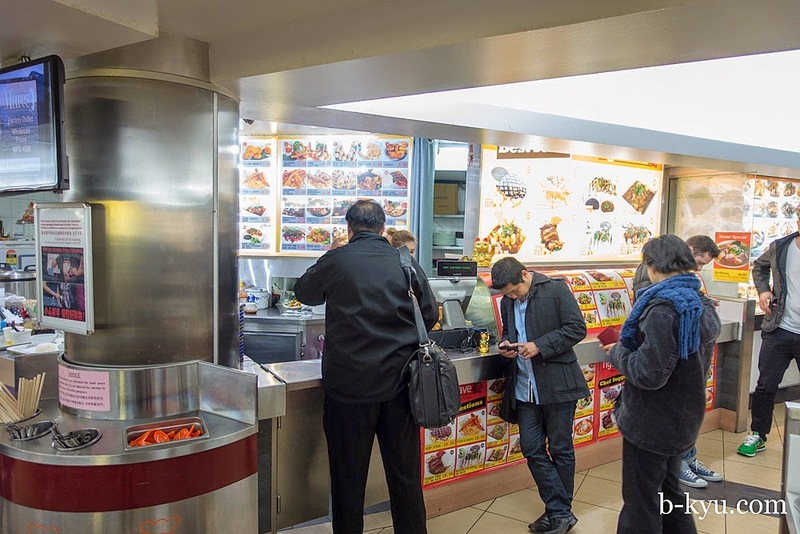 Our mission to eat at every Chinatown foodcourt stall brings us to Tiger Cave. We must admit we were skeptical to begin with. The menu is an oddball mix of Thai and Western dishes. Plus we had a weird illogical resentment to Tiger Cave because it replaced one of our favourite stalls, Singapore Shiok. Stupid but true. So we put off visiting for a while, but duty called and we head in for some noodles. We notice the menu is bursting with interesting Thai dishes, and there's barely any same-same Aussie Thai stuff. Rippa. We quickly got to be fans of the Tiger Cave, which sounds like the setting for some so-bad-it's-good action hero movie. More likely it's named after the mountain top Tiger Cave temple in Krabi (วัดถ้ําเสือ or Wat Tham Suea). With Tiger Cave's wacky menu and name it would be easy (and fun) to write something snarky and piss-takey about this place, but it's actually pretty good. It's run by some very friendly Thai folks, we've noticed a trickle of Thai customers too, always a good sign. The suave Chef Wit has his own cooking style, it's sort of street style with a restauranty touch, we love trying his take on things, especially when he gets a bit cheffy. Alison's favourite dish is the stewed pork leg on rice, Mr Shawn's pick is the steamed barramundi. Winter special - pork blood jelly soup - $9.90. The broth is plain and thin with lively fresh zing, we love it. 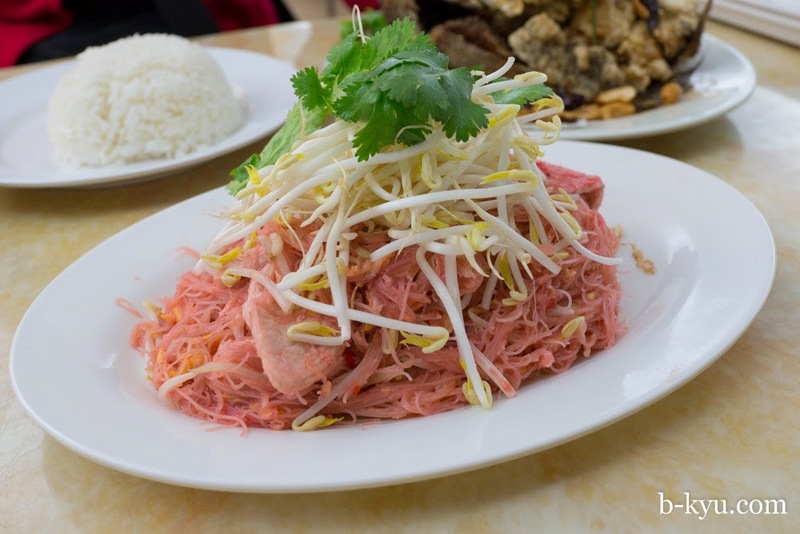 It has many piggy parts, mysterious and otherwise, with rice served on the side, a nice change to noodles. A large serve of crisp pork rinds on top adds yet another porky layer, they are flavoursome either crisp or soggy. Chilli-philes or phobes note there is no chilli in this dish, add if needed. 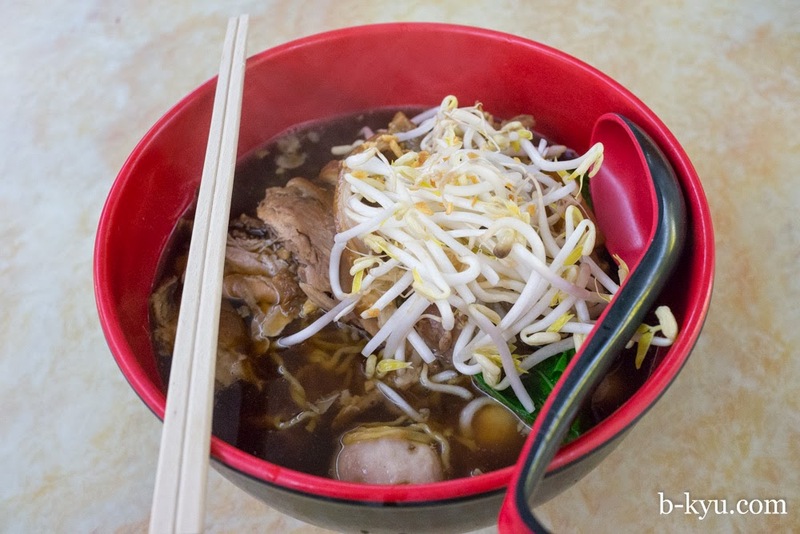 #27 Kua kai noodle - $9.90. 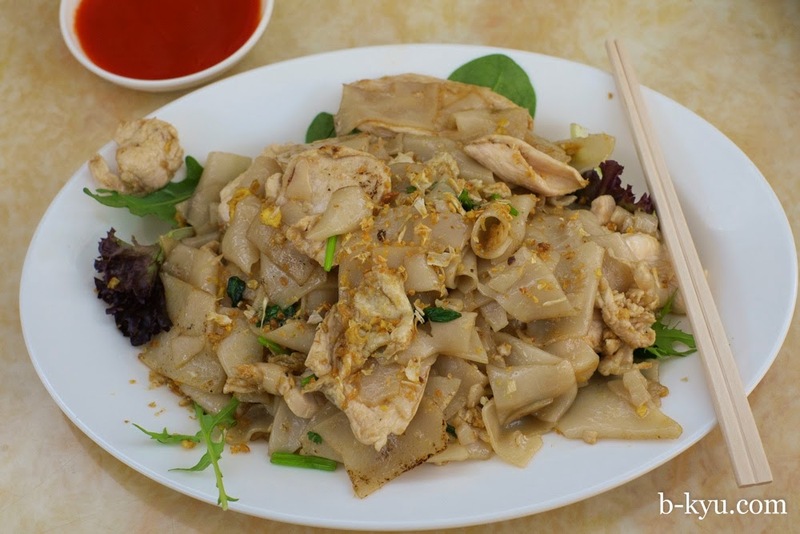 Like a chicken char kwai teow - stir fried flat rice noodles with some lovely big slices of chook. It's a plain dish but the smokey wok flavours make it a winner. Here's a random post on this dish in Bangkok. 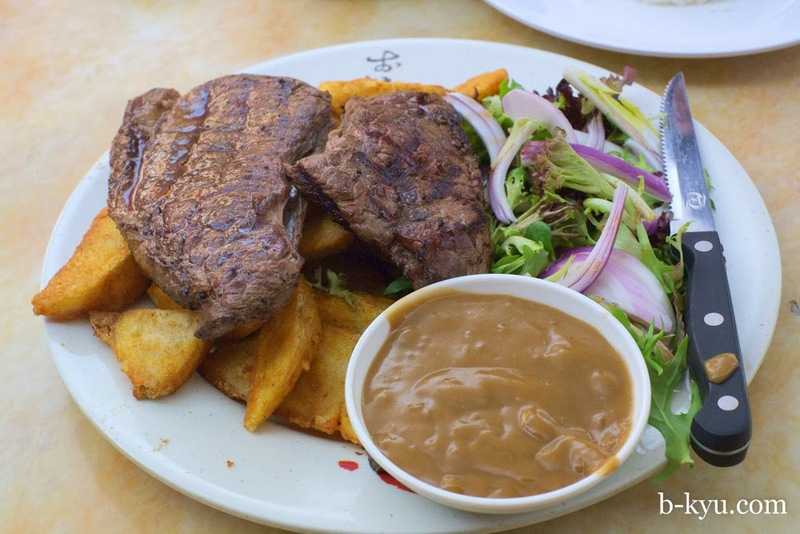 Rump steak and chips - $10.90. 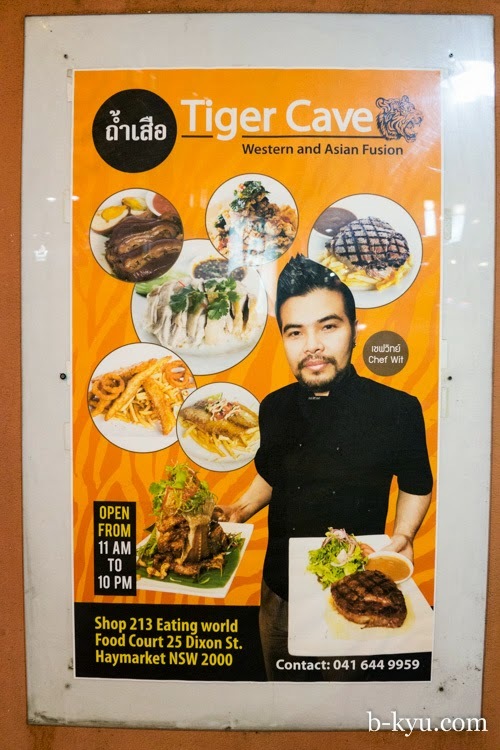 Who would order rump steak and chips in a Thai food court stall? Let's just say that now and again we take one for the team. The steak per dollar factor is high, in fact the chef could have cut the side bit off to save money and we still would have been happy, it was tough anyway. The main hunk of the steak was tender and cooked rare as ordered, rather excellent. It comes with mushroom sauce (or gravy) which tasted a bit Masterfoods but who cares. BBQ pork neck on rice - $9.90. Thai BBQ meat is always good. An extra thumb up for the dipping sauce which was semisweet with a touch of sour, chili and pepper. A generous serve of pork, grilled with smoky and crispy end bits and sliced so it's easy to share. 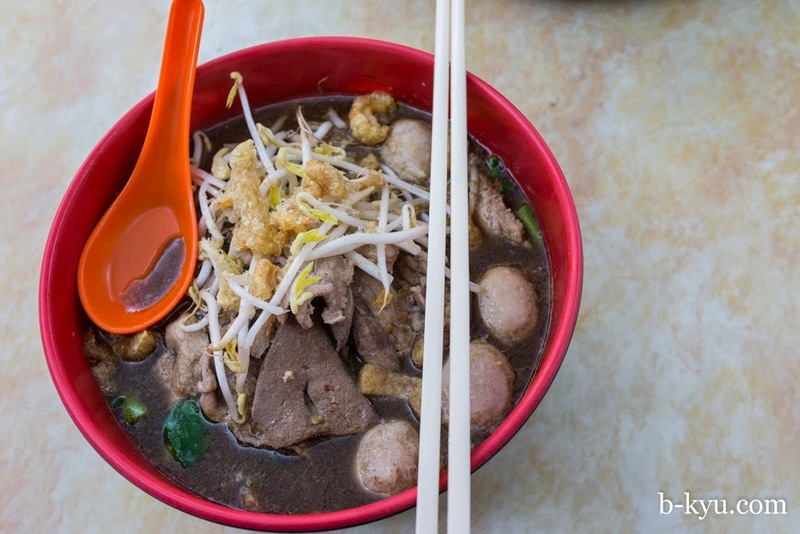 Boat noodle soup - $9.90. 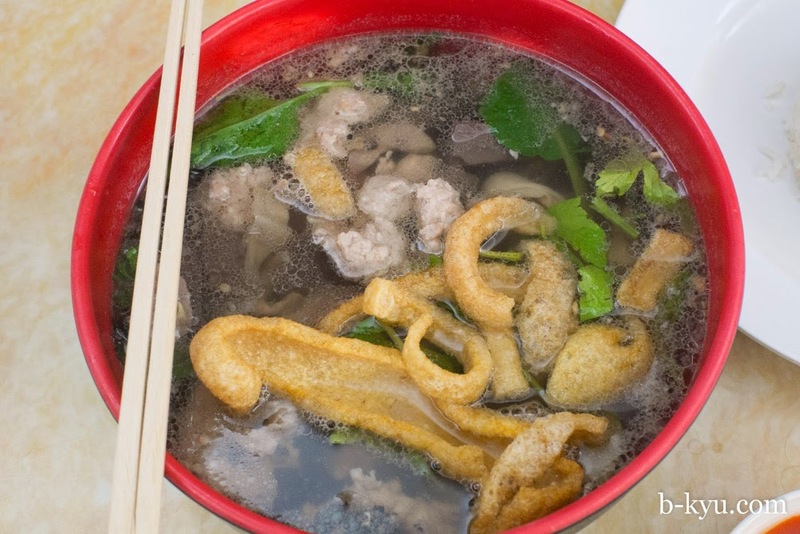 A big serve of the classic Thai beef noodle soup, this one comes with bonus offal. If you don't like offal you can easily fish it out and give it to Alison. 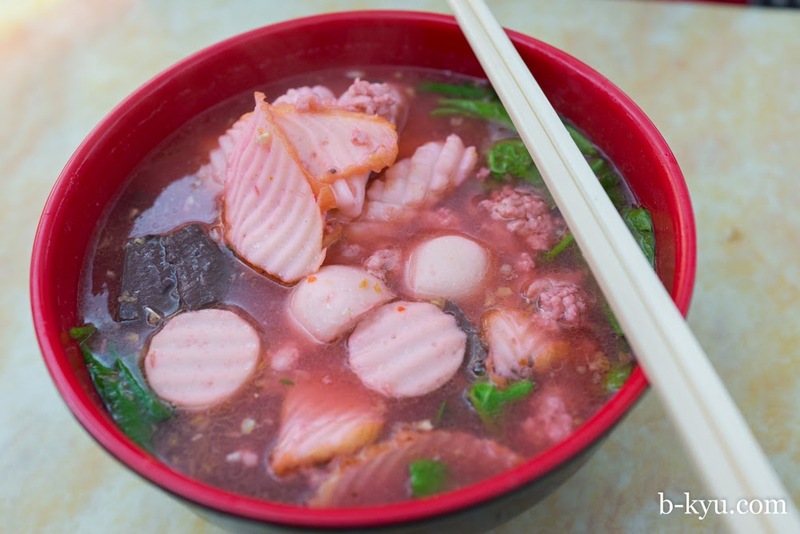 Pink noodle soup (Yen Ta Fo) - $9.90. Another classic Thai soup, it's usually way too sweet for us but here we like it. The pink colour comes from fermented red bean curd but there isn't a strong flavour of it in the broth. There was a treasure trove of fish slices, fish balls, blood cubes and little chicken mince meatballs in the bowl as well as fat flat rice noodles. Pad mee - $9.90. This dish was a lucky mystery punt - it's like a dry version of the pink soup above. Thin noodles with a couple of nice slices of pork and a slight sweet flavour to the noodles. It works well. Crispy chicken basil - $10.90. 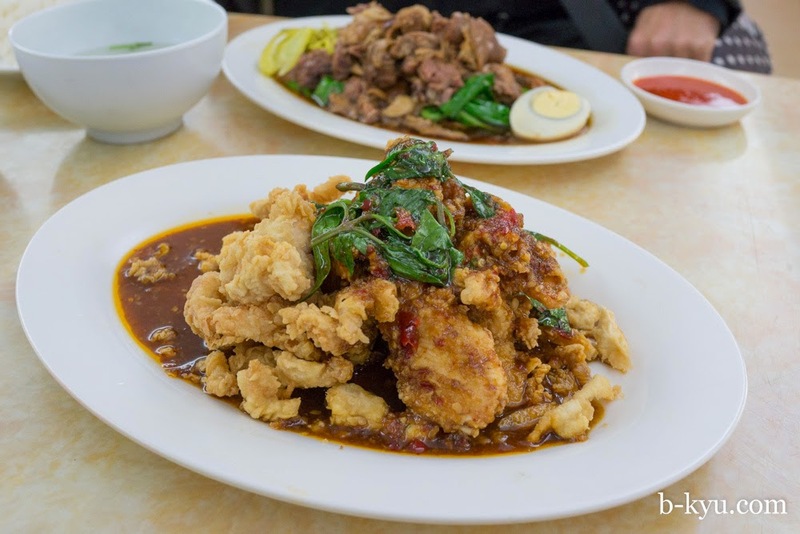 Deep fried chicken pieces topped with basil in a sweet/salty sauce, which we guess is tamarind, palm sugar and fish sauce. Just a guess. 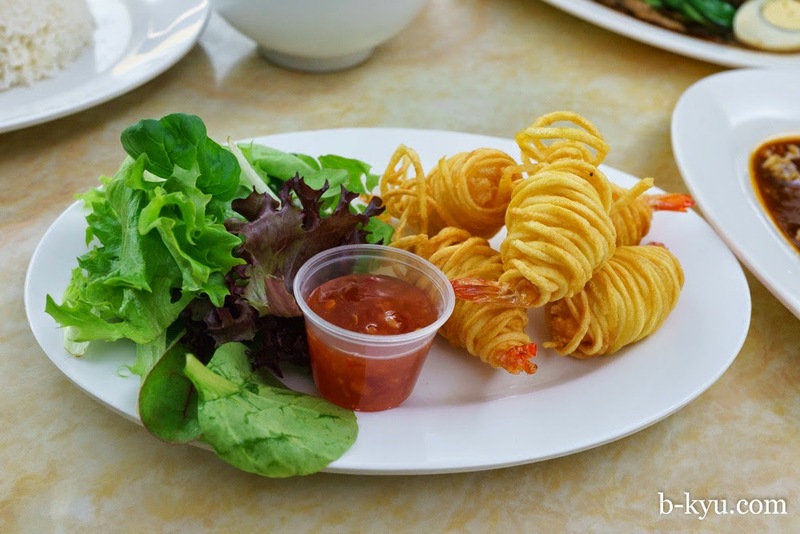 Prawn potato wrap - $6.90. A fun entree of prawnies covered with threads of crunchy fried potato. We reckon this could be a hit. 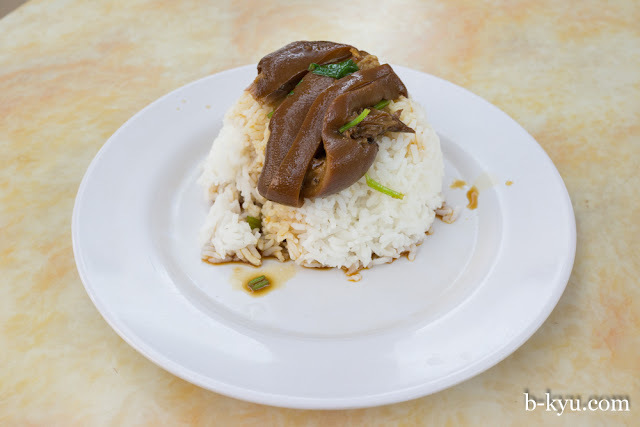 Stewed pork leg on rice - $10.90. A huge serve of this classic Thai street food dish, served with rice on the side and chili sauce. You could easily share this between two people and walk away happy. 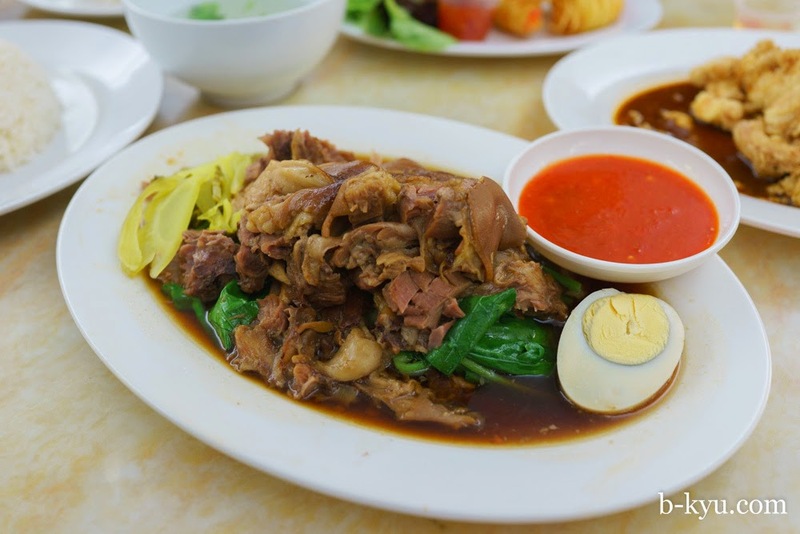 Stewed pork leg noodle soup - $9.90. Same lovely fatty pork as the prior dish but in soup, with nice springy egg noodles, mystery meat balls and and sweet meaty broth. Pad pak vegetarian - $9.90. Stir fried mixed fresh veggies with rice and soup on the side. 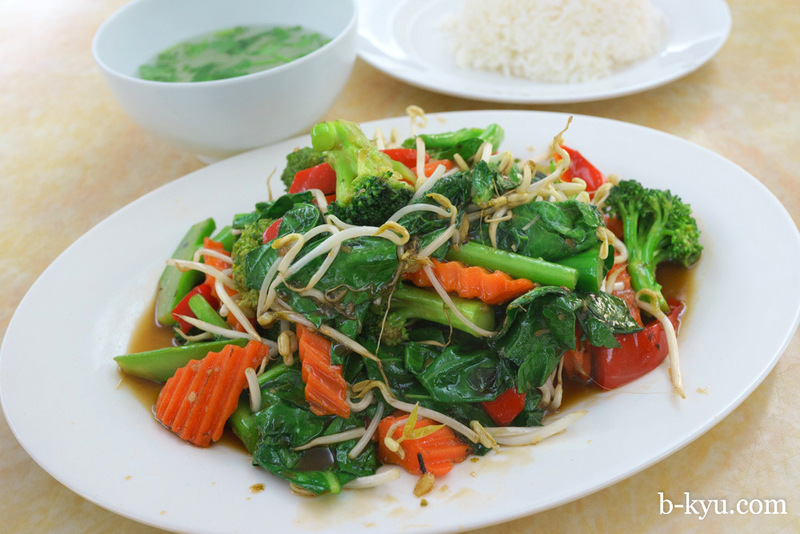 This is an excellent Monday anti-scurvy lunch, the veggies have a nice snap to them and they are flavoured with a simple Thai sauce, which we guess is fish sauce, sugar and maybe soy. Steamed barramundi - $10.90. 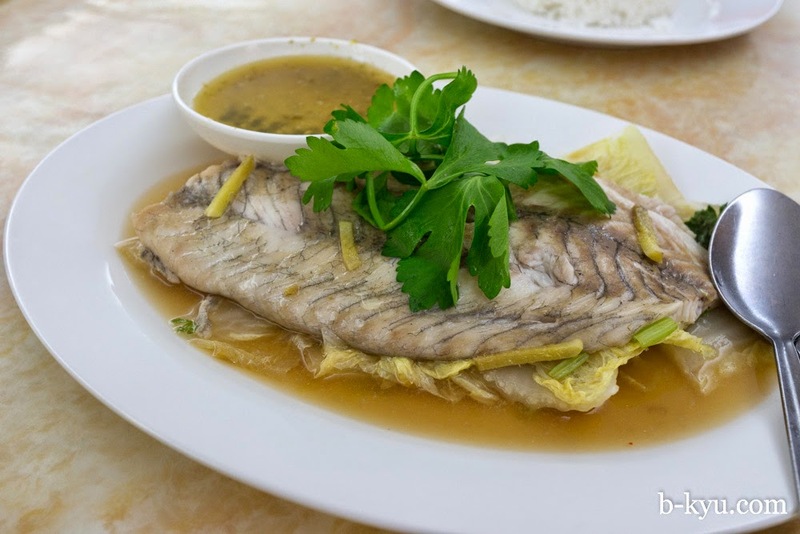 We usually don't order steamed fish in the food courts because the type of fish they use is much better suited to frying, when it is steamed you get those muddy river fish flavours. But this dish is a corker, it is steamed with enough ginger (and soy or something) to complement the flavour of the fish. The green chili dippy sauce has quite a bite to it. Rice is on the side. A supremely light and tasty lunch, highly recommended. 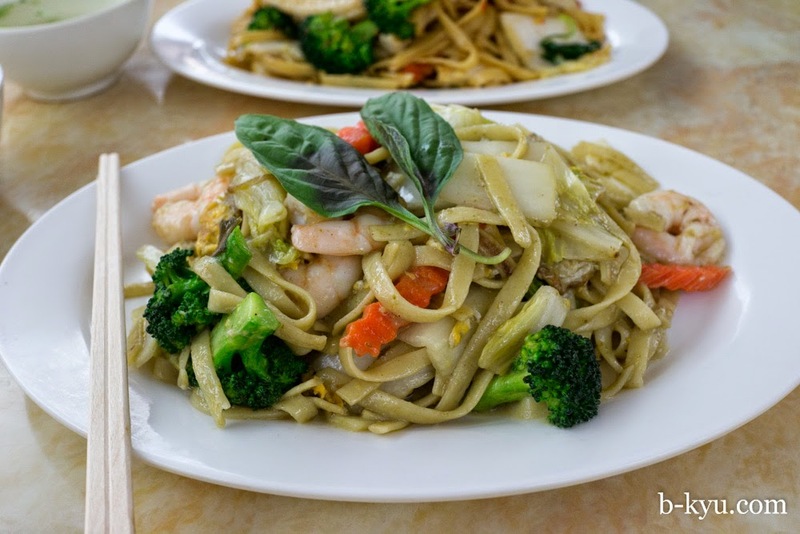 Green curry pasta - $10.90. 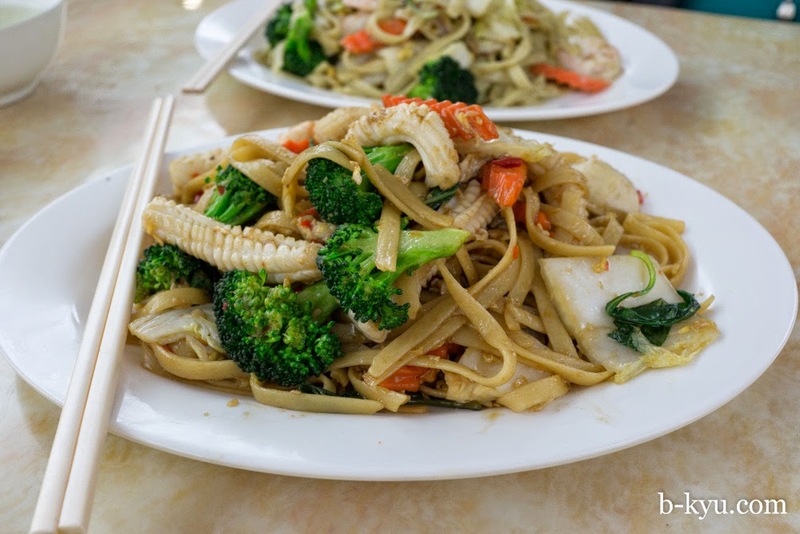 We tried the pasta dishes in the spirit of adventure, taking another one for the team. The green curry pasta works surprisingly well. Chili basil fettuccine - $10.90. Like the green curry pasta, this dish was also far tastier than it should be. 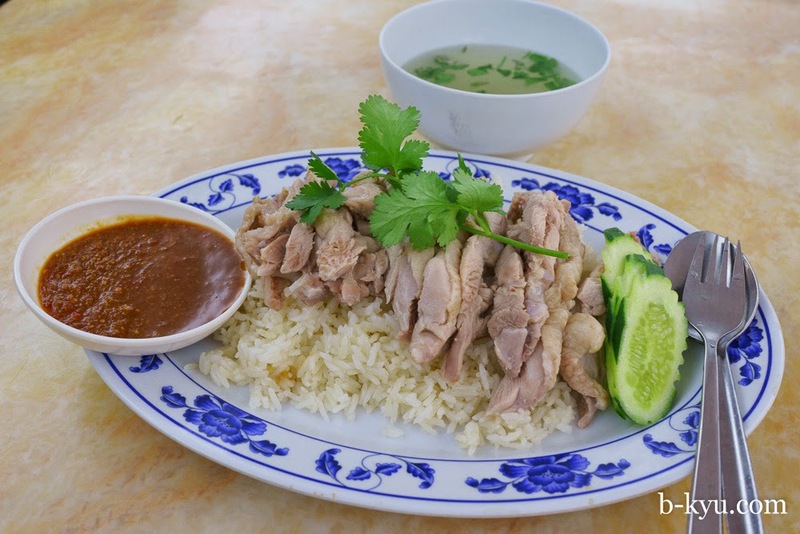 Hainan chicken rice - $9.90. 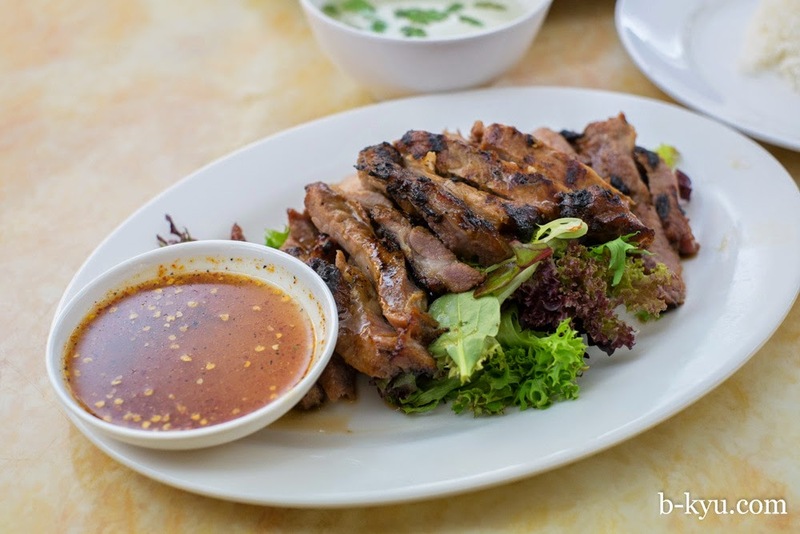 We love the Thai version of this traditionally Malaysian/Singaporean classic. It's not your silky soft chicken but it tastes pretty good all the same, and it's a large serve too. The sauce has a nice kick. 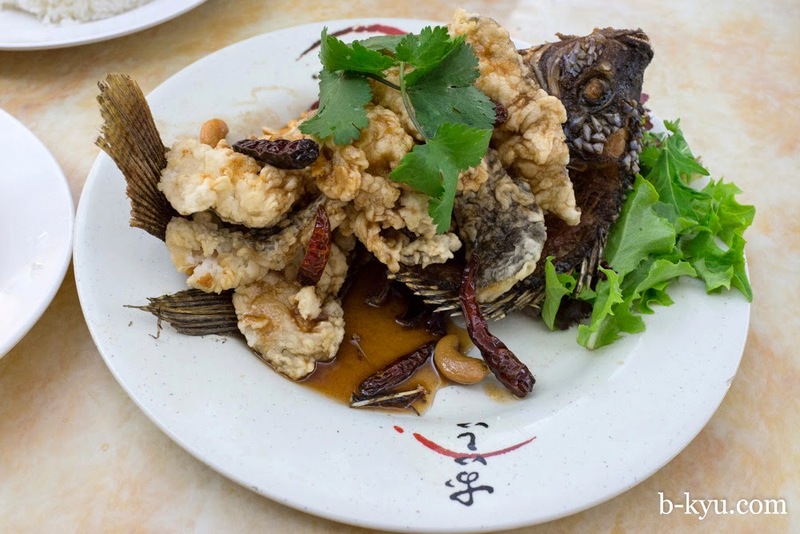 Whole fish in tamarind sauce - $11.90. Beautifully presented - filleted with the fillets sliced and cooked separately then stacked up on top of Mr Fish. The fish fillets looked like 'popcorn' fish, though not as crunchy as we hoped for. The best part was the main part of the fish which went crunchy and soaked up the sweet sauce. We reckon if the fillets had a bit more crunch this dish would have been magical, but dang it was close. 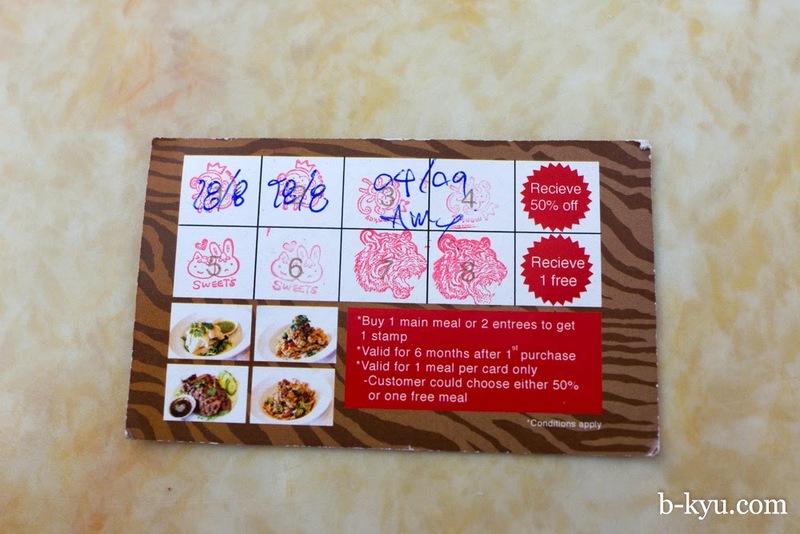 Part of our shtick is we never accept free meals but we did fill up our loyalty card and get a free noodle soup. We are two-faced sellouts, the U2 of the foodcourts. 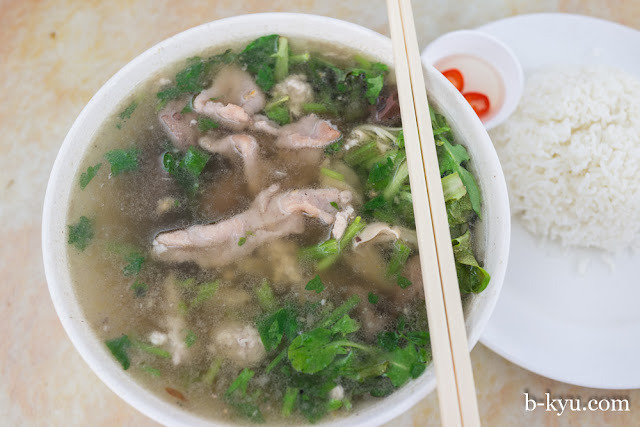 The stewed pork leg soup ($10.90) is a humdinger. 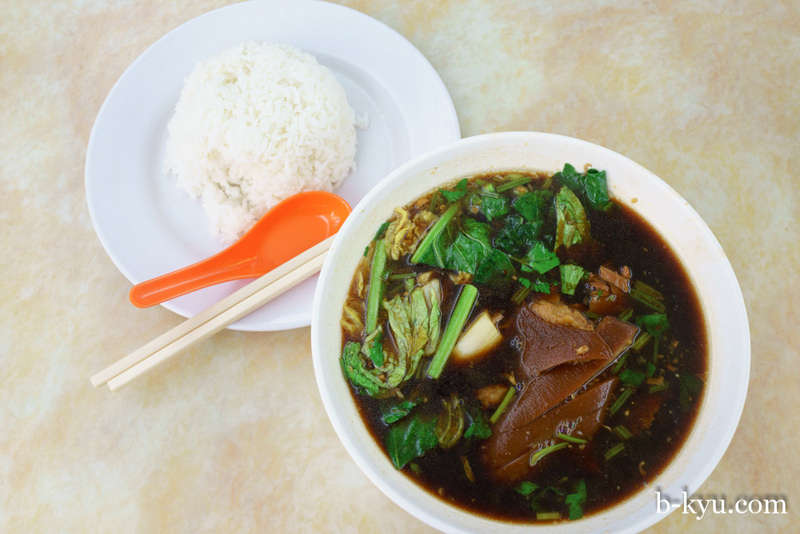 There's a surprisingly generous amount of luscious, super tender pork in a big bowl of sweet, dark broth, livened up a little with Chinese greens and lettuce. How beautiful is that stewed pork leg? The winter special/pork blood jelly soup ($9.90) is as good as last time we tried it here, a hangover curing delicate light peppery broth and lots of it. There's also lots of piggy innards though no pork crackling on top this time. 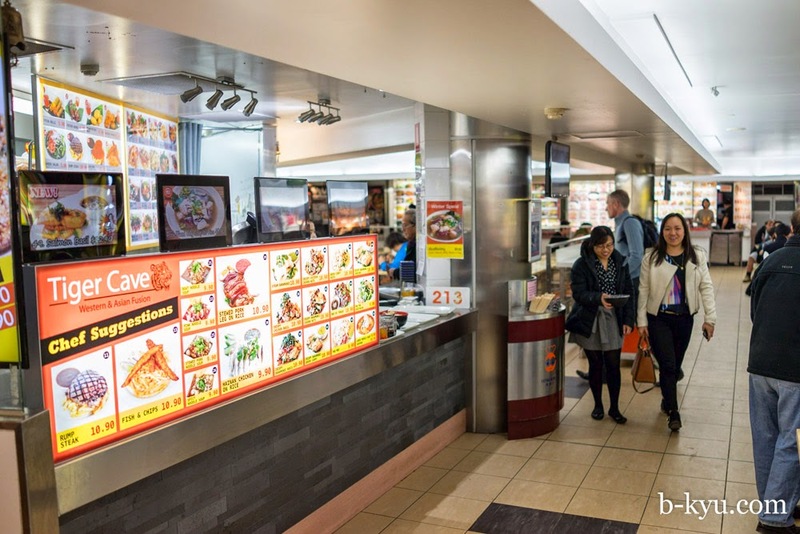 Tiger Cave is in Eating World Food Court, top of the Dixon Street Mall, Chinatown.